To create a bike that not only reflected the styles I like, but to push my skill set in fabrication. I had this vision for a long time and was grateful to be in a position to execute it. My wife and I stumbled upon the Handbuilt motorcycle show in Austin, TX while on vacation and it inspired me to start this build, my first ever. I designed and hand made the frame and girder frontend, which are polished 316 stainless steel. The finished product. I put my heart and soul into this build with many late nights asking myself what I had gotten myself in to. The overall lines and ride ability of the bike are what I am proud of. The reception of my build has been overwhelming…I never imagined that something I built in my garage behind the house would be received so well. Many people assume that the bike it all chrome. Countless hours of hand polishing the stainless gives this effect. All I can say is WOW! Man o’man, THAT’s a real Harley. 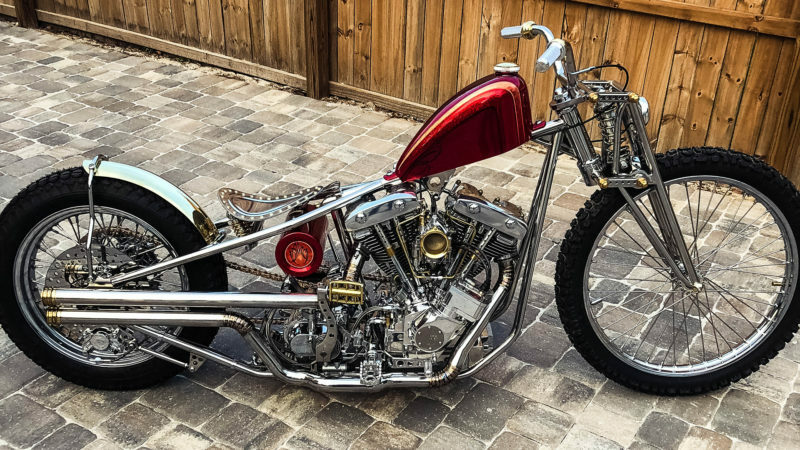 The Shovel was the last of the classic all American Harley Davidson’s. This ain’t no weekend, Hollywood Poser motorcycle. This is a true bikers bike. Bad to the bone, brother! And the suicide clutch…..1%er big time! 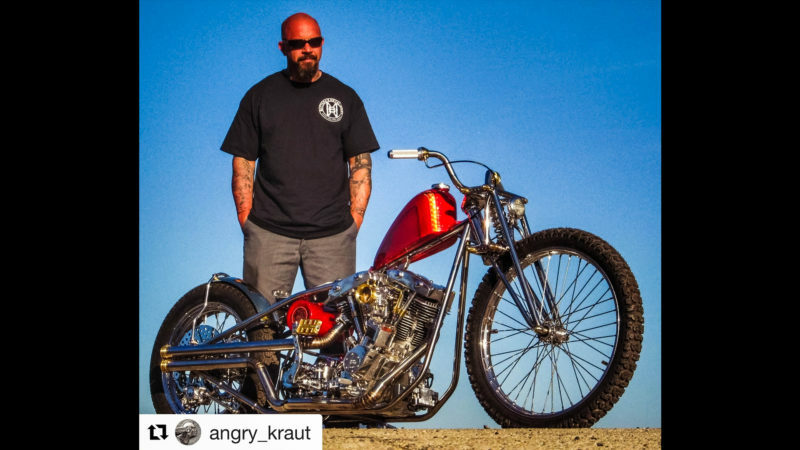 Nothin’ says real biker like watchin a brother footin that clutch and stirring the box with his lefty. Brother… This is truly a “VISION” bike that has been built by a man that saw every piece of it beforehand and took his time to recreate each piece, from HIS MIND. As a veteran (40+ years) “builder from the garage”, you cannot realize the time this beautiful scoot actual took Jack. This fabricated piece of machinery is Jacks “vision” combined to become the motorized, artistic mover of a man to be admired by all and Jack should (and I’m sure) so proud. I’ve admired this mans skill-sets, big time since I first saw this scoot in The Horse”! Kudos, kudos, and a thousand kudos, brother. This is just too awesome. 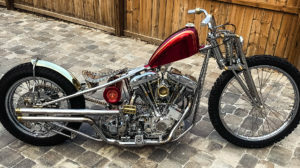 Engine: 1977 Harley-Davidson Shovelhead. Motor work by Tom at RED Racing Pampano, FL. Engine is stock displacement with a Morris Magneto. Many cosmetic parts from Old-Stf including hard oil lines. Intake: Polished S&S Super E carb with SpeedDealer Customs solid brass mini velocity stack. Exhaust: Handmade 1.75 stainless pie-cut shotgun style. Transmission: Rev-tech Jockey shift 4 Speed reachet top with Baker N1 shift drum. Shifter arm by After Hours Choppers, and kicker pedal by Fab Kevin. Suspension: Handmade 316 stainless steel girder frontend with custom made Works Performance shock built specifically for this application. Wheels, tires and brakes: Front wheel is a 23” Built by Bobs Cycle Supply with a Bridgestone Trailwing tire. The rear is a DNA 18” with a 4.00x18 Firestone vintage tire. The rear brake is a Kustom Tech caliper on a Russell rotor. Finish - Paint: Paint and pin stripping by MrOz Designs using Painthuffer Ruby Red flake. Accessories: The handlebars are handmade stainless steel with grips from SpeedDealer Customs. 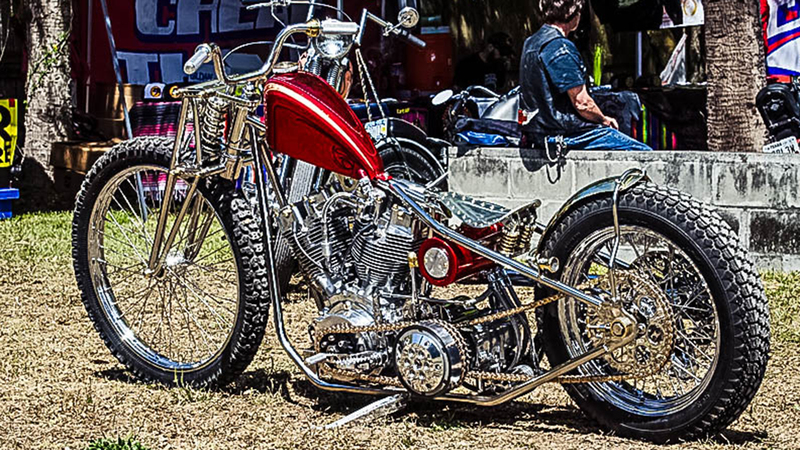 Seat is custom made with aluminum bead rolled top by Jamey Jorden. Mid controls are from Boosted Brad. All brass parts on bike are machined from solid stock . Gas and oil tanks are both handmade. Headlight is custom LED from SpeedDealer Customs.